Supports any tree, any location. Supports banks in the web. Works in a confined area. You will need to set the script's settings using the GUI. The work area is essentially the area around you to cut trees in measured in tiles e.g. a work area of 2 will cut all trees within 2 tiles of your starting position. When banking, it will use banks supported by the web. If it doesn't bank, it means it is not supported by the web. sadly, I don't have the logs, I exited before gathering them. The actions list showed that it continually tried to interact with the banking box inside the guild area. Its because it looks for the closest bank booth and banking is really scuffed right now. I will fix it in the next update which has already been submitted. It will be version 0.03. Would be nice to have an example of how to set up the script. Can't figure out how to format the work area. I will update OP later. It works based off distance from your start position. So putting something like 1 will cut all trees within 1 tile. Putting 13 will make it cut trees within 13 tiles. Edit: So after 8-10 minutes of running the script, the client freezes and I have to restart the client entirely. Don't know if this is something on the scripts end, or the client. I am not getting any error messages in the debugger. It is essentially defining an area. Banking in Lumbridge won't work till we have the web. Remember that it can only bank with bank booths/chests that are loaded and are freely walkable to. About the freezing, I'm not sure. Never had that. It might have been related to an earlier bugged version of the client. Make sure you are using the latest version of the client through the launcher, there was an update released earlier today. Edit: Submitted an update to make it much faster. It won't be checking if a tree is reachable anymore since it was eating too much CPU so just make sure the tree is in ur confined work area. Edit 2: It will be checking if trees are reachable once again. Found a workaround thanks to Zach. Same issue with banking @ guild bank by GE. Haven't looked at the API yet, but couldn't you hardcode it ignoring that bank, fetching the second closest bank on the "unreachable" message, or just hardcode banking @ the GE? Edit: The script opened bank, deposited logs, then froze there with the bank open. Im going to manually check this location in a few hours. Edit: I have submitted a fix for the cooking guild bank so that it will not be used. I had to manually blacklist this bank for now. GUI now requires you to just select your tree instead of typing their names and logs produced. 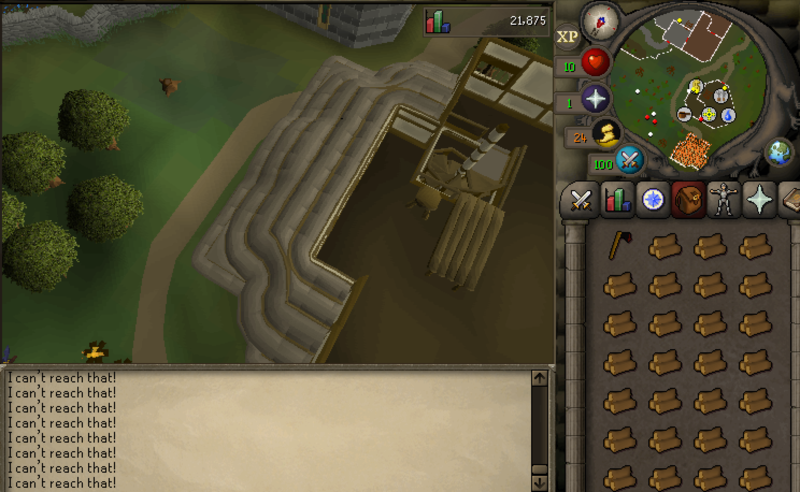 Is there a way to make it bank at deposit boxes instead of booths, or to choose a preference? It's a lot quicker and bypasses the pin when depositing logs. Can we get firemaking support?